RENOWNED property developer Tan & Tan Developments Bhd, which is known for developing high-end projects, is not limiting itself to this segment if it considers other prospects viable. “We develop projects for all segments and across the board, and not just high end,” IGB Corp Bhd property development head Teh Boon Ghee tells StarBizWeek. Tan & Tan is a wholly-owned subsidiary of IGB Corp.
“If it is viable and feasible, we will do it. We have found a niche in the market and prefer to do more value-added projects,” Teh says. Established in 1971, Tan & Tan is known for developing the first condominium lifestyle concept in Malaysia with Desa Kudalri in 1979 and Sierramas in 1993 - the first gated community development in the country. One of the company’s latest developments, the G Residence service apartments project at Jalan Desa Pandan, he says, is “not too expensive” compared with other projects within the area. “We don’t think it’s expensive, seeing as response is quite good. It is around the range of terrace house prices within the Klang Valley,” Teh says, noting that other apartments within the area ranged between RM850 and RM1,100 per sq ft. According to Teh, the G Residence units are priced at an average of RM650 per sq ft with an expected maintenance fee of 30 sen per sq ft, including the sinking fund. Units range from 1,080 to 1,545 sq ft, and are located on two 23-storey-high blocks. Selling price are between RM610,000 and RM1mil. He says that the units are targeted at young couples and families. Despite the recently tightened lending rules, Teh says he expects the G Residence service apartments to be fully sold within the next few months. “Since sales opened in December, about 80% of the 474 units have already been sold. Over the next one to two months, we should see more units sold,” he says. Teh says he is confident of full take-up given the response the development has received so far and despite the recently tightened lending rules. However, Teh does believe that the new rules will have some impact on property buying trends in Malaysia. Effective this year, banks have started using net income instead of gross income to calculate the debt service ratio for loans. This pre-emptive move by Bank Negara is meant to contain the rise in household debt. Separately, a recent online property survey conducted by the iProperty Group covering Singapore, Indonesia, Hong Kong and Malaysia, revealed that demand for houses priced at around RM1mil had dropped and was expected to be flattish throughout the rest of this year. iProperty Group chief executive officer Shaun Di Gregoria was quoted in a local news report as saying that Malaysians were expected to continue to be upbeat about the property market, with interest seen mostly in properties priced between RM400,000 and RM500,000. Teh meanwhile noted that location played an important factor in the development of property, adding that the company’s G Residence was strategically located. “G Residence is just a few minutes’ drive away from the Kuala Lumpur city centre and within embassy row. 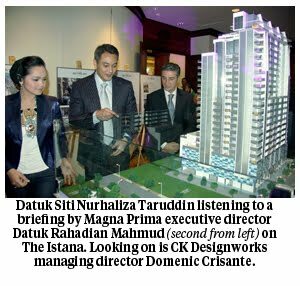 Construction of G Residence, which has a gross development value of RM430mil, has commenced and is expected to be completed by February 2015. The project is located on 1.46ha of leasehold land. Two car parking bays are allocated for each apartment. G Residence is being developed by Opt Ventures Sdn Bhd, a joint-venture (JV) company between Tan & Tan and Sin Heap Lee Sdn Bhd. The current rental price is RM4,000 per unit, with an approximate size of 1,500 per sq ft. Teh says the retail space will not be for sale. “This is so that we can have better control (of managing the tenant mix),” he says. On its other projects, Teh said IGB is developing an apartment project in Jalan Tun Razak, which the company hopes to launch by mid-2013. It also has a JV bungalow project with KL Kepong Bhd. IGB has some 688ha of landbank in Malaysia. EARLY last week, one of London’s largest lettings agency gave a presentation to a small but eager group of investors who have either bought, or about to complete negotiations to invest in a property in London. Most of them are buying foreign real estate for the first time while a few of them have been landlords for several years. Despite that, they still had questions about various issues like taxation and rights of landlords/tenants. Many of them have formed an attachment with Britain because of their student days. Some have children studying there. Yet, there are others who bought into that market to take advantage of the favourable currency exchange rate as it has dropped quite a bit since 2008 and because of the drop in real estate prices. Most, if not all of them, have bought off-plan. While some of them have visited the location of their future property, many of those who were present at the presentation have not. So it was a rather enlightening evening for most of them. Anita Mehra and her team from Benham and Reeves Residental Lettings gave a bird’s eye view of the London rental market as many of them are keen to see some sort of yield from their investments while being an absentee landlord. She answered questions about yield for the different areas, the popularity of some areas over others, the advantages of one and two-bedroom units versus three-bedroom units, the benefits of buying in central London versus one located on the fringe of the city. Mehra says yield will not be all that attractive and instead suggested that capital appreciation will be a better option for investors to consider. As the evening wore on, it became obvious that while rental yield was important to the investors, it was the issues related to property ownership in a country they are unfamiliar with which brought them out for the evening. Being a student tenant in their younger days and now being the landlord means they are now sitting on opposite sides of the fence. They are driven by different forces. Many of them have questions about taxation. This includes taxation from UK’s Inland Revenue Department, local council taxes and the issue of the 40% inheritance tax. There were questions about insurance, length of leases and what recourse they have when a tenant defaults on rental or reduces the duration of a lease. Because everything is governed by laws and rights, they are also concerned that in the event of a default, the services of a lettings agent may no longer be adequate and there may be the need to engage legal help. There were also many questions whether it was better to take a loan, or to pay cash and why. It is obvious that being a landlord in Malaysia and a landlord in Britain present two sets of challenges. Mehra answered all these questions with patience but the fact that such questions were posed indicates the fact that they were generally unaware of or have little information when they bought the properties and the implications of that investment. Foreign property ownership is something that is relatively new to many of these middle-income investors. Says an investor who bought a property two days before attending the presentation: “I was not able to sleep the day I signed on the dotted line. Many of these presentations were very property oriented. The girls who attended to us told us the property was X minutes from the subway, has X number of rooms and what the price includes and what discount they can give us. I have no idea what the tax issues and property ownership is going to be like. “At many of these presentation, I was serviced by young personnel who passed me from one colleague to another simply because they cannot answer my questions. Sometimes the property developer and a lawyer are present. But they were unable to give me their single-minded attention. So it was good to have Anita (Mehra) here to answer all our queries,” he says. At the minimum, a property in London would cost about £200,000 or thereabouts. With an exchange rate of RM4.80 to £1, that works out to about RM1mil. That is a lot of money in exchange for a property located in another country whose cultural and legal environment we are unfamiliar with despite the fact that our legal system is pretty much British-based. At the same time, the people who sold them the property need to upgrade the skills and expertise of their personnel because selling a property located in Malaysia to Malaysians and promoting foreign real estate to Malaysians pose two different sets of challenges. Selling foreign properties requires a deeper knowledge of the culture and laws of that country. Those who promote foreign properties need to put themselves in the shoes of their investors to understand their concerns. Assistant news editor Thean Lee Cheng thinks marketing personnel need to be very familiar with a foreign market and that includes legal issues before marketing a project there.